WOHFEST 2017 is an event that contains of 2 competitions. 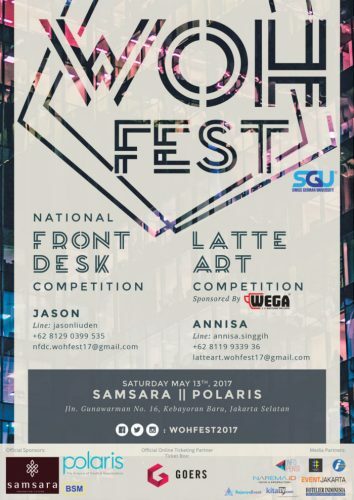 National Front Desk Competition and Latte Art Competition. National Front Desk Competition (NFDC) will compete about contestants’ integrity while handling with hotel’s most treasured asset, which is the guest. Through the University/Vocational Level and Hotelier Level, we will find out the champion of the best Hotelier on each level. Latte Art Competition is a platform where the combat of contestants’ creativity will take place. The purpose of this competition is to find the perfect image that should be created on top of the Latte. This battle will be put into 2 divisions, which are Amateur Level and Professional Level. WEGA MACCHINE PER CAFFÈ will sponsor Latte Art Competition. The competition will be closed by performance from NSBETM. JOIN US TO WIN TOTAL PRIZE WORTH OF 20 MILLION !! PROOF YOUR WORTHINESS OF A HOTELIER ! !